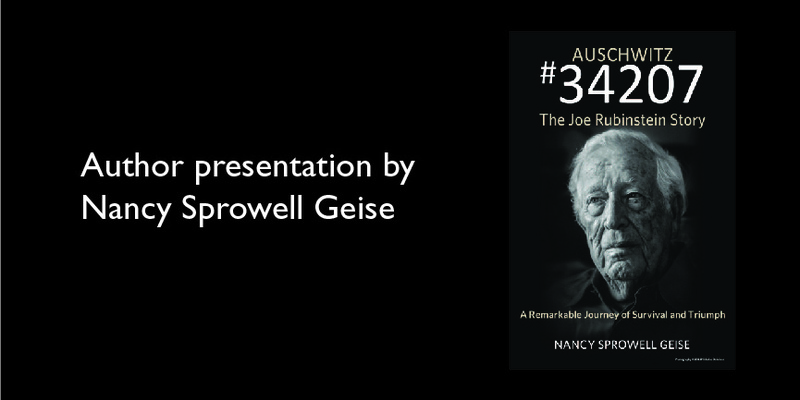 Author Nancy Sprowell Geise will visit Hesston College on Tuesday, April 2, to share the remarkable story of Holocaust survivor Joe Rubinstein, which she wrote about in her book Auschwitz #34207: The Joe Rubinstein Story (2015). The event will be at 7 p.m., at Hesston Mennonite Church on the Hesston College campus, and is open to the public. A reception sponsored by Hesston Public Library and Hesston United Methodist Church following the presentation will offer audience members a chance to meet Geise. Geise, who lives in Topeka, met Rubinstein when they both lived in Colorado. Geise learned that Rubinstein, who was born in Poland, was a survivor of the Auschwitz concentration camp as well as others during World War II, but he told her he would never speak publically of the experiences he endured there. Five years later he changed his mind. Rubinstein, now 98 years old, was 21 when Nazi soldiers took him from his home along with his widowed mother and two siblings. Geise’s recounting of his story shares the atrocities he faced over the next three years until the end of the war. Of particular note in Geise’s writing, is that Rubinstein did not let the pain, torture and horrors he faced as a prisoner define his life, but rather chose to find joy and rise above the evil he endured. Following the book’s release in 2015, Auschwitz #34207 earned the top spot on the Amazon Bestseller list in the Holocaust Memoirs (Kindle) category, and has garnished high praise from leading Holocaust scholars, national reviewers and readers. Geise has traveled the country sharing Rubinstein’s story, including at the U.S. Library of Congress and as the keynote presentation of the 2016 State of Kansas Holocaust Commemoration Service. Find further information about Auschwitz #34207 and Geise.